At Weyford Nursey and Primary School, we endeavour to create a positive atmosphere in which children feel safe, happy and secure and can take full advantage of the opportunities for learning. We also encourage children to develop their self-discipline and self-esteem as they grow within our school community. *Resilient Rhino: “Being resilient makes me brilliant because I never give up”. to enable children to understand the system of rewards and consequences within the school. 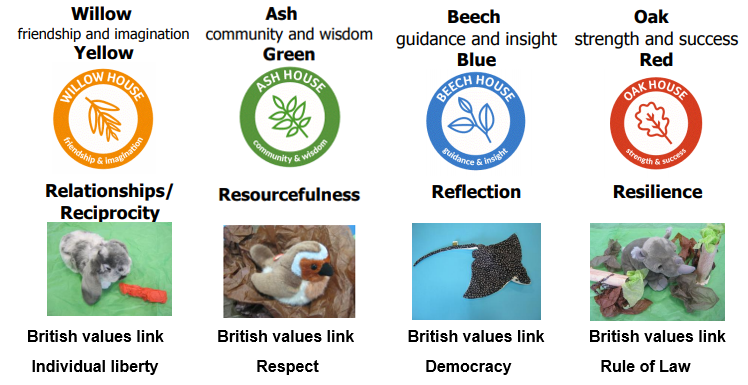 Emphasis is placed on the rewards the children get from taking pride in their achievements, the sharing and recognition of good work, teamwork, positive attitude and positive behaviour. Children will be allocated a House when they join the school. Each house will also have members of teaching staff allocated to it. Each class will display a House Point Chart for each of the four houses. These charts will list the names of the children in each house. There will be a tally system for recording house points against each child’s name. Individual teachers can decide how they want to record house points. This may happen as a house point is awarded, or at set times during the day. House points may be recorded in workbooks and it is important that children are given the opportunity to see this reward and add it to their own tally. Each Thursday afternoon, House Captains/Vice Captains for each House will collect the House Points earned from each class. They will calculate the total house points for their team and hand it in to the office, to be announced in Celebration Assembly each Friday morning. On Friday mornings, the Headteacher will announce the total house points for each team that week. This will be added to the existing total, and the new total will be displayed on the House Point display. At the end of each Half term, the house with the most house points will have their colour ribbons tied onto the cup which will be displayed in the hallway. Existing rewards such as stickers, pebbles in the jar and Golden Time within school will remain. As will opportunities for children to share work and achievement during lessons and assemblies. Sending a child to another teacher or the Headteacher for praise will also reward good work or behaviour. All our systems are to encourage children to talk about the positive features of their own work and behaviour and that of others.